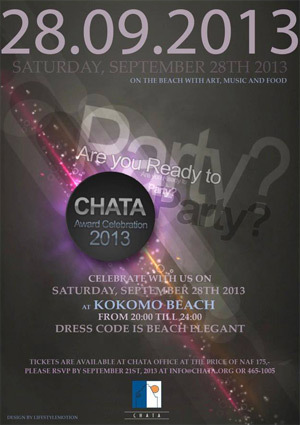 We just received an email stating that CHATA has cancelled their CHATA award celebration at Kokomo, scheduled for this coming Saturday. To us this sounds like they were either too ambitious in their plans or they just didn’t sell enough tickets (combination of both maybe?). We all know that the people here don’t decide what they’ll do until the last minute so we’re guessing it’s the tickets situation. It really is too bad because we thought it was a great initiative to have a party on the beach instead of a boring awards ceremony in some ballroom somewhere. Maybe they’ll try again next year with some more forethought? Posted in News on September 24, 2013 by Joost.